Tiger's Nest Prayer Flags Bhutan by Ken Hayden - 10.000" x 6.625"
Tiger's Nest Prayer Flags Bhutan acrylic print by Ken Hayden. Bring your artwork to life with the stylish lines and added depth of an acrylic print. Your image gets printed directly onto the back of a 1/4" thick sheet of clear acrylic. The high gloss of the acrylic sheet complements the rich colors of any image to produce stunning results. Two different mounting options are available, see below. 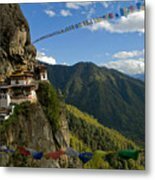 There are no comments for Tiger's Nest Prayer Flags Bhutan. Click here to post the first comment. 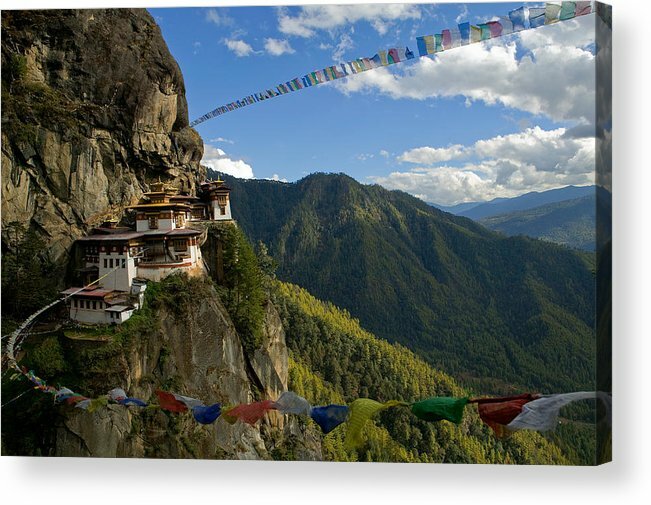 I shot this image of Tigers Nest outside of Paro, Bhutan while on commission for the Taj Hotels of India which had just opened a hotel there. 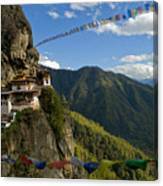 It was a 2 mile climb to get to this Buddhist temple which was built on a 1,000 ft sheer cliff face. 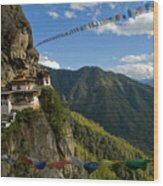 I asked my guide how the prayer flags were strung across from one cliff to another.. simple, my guide replied. We tie them to an arrow and shoot them across!